Add classic glamour to any look with these stylish drop earrings. Crafted from luxurious 9ct yellow gold, these earrings feature an elegant groove designed stud leading to glittering heart shaped cubic zirconias for breathtaking shimmer and sparkle. 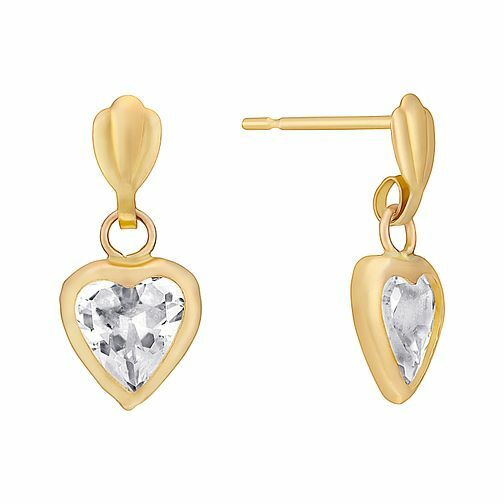 9ct Yellow Gold & Cubic Zirconia Heart Drop Earrings is rated 2.0 out of 5 by 1. Rated 2 out of 5 by Anonymous from Good quality but too small I misjudged the size. They are too small to drop properly. I received them, tried them on but then couldn't return them as they'd been in my ears. The model in the photo made it look like they would clear my lobe but they don't really. I am disappointed.